Sticky Footprints: Sticky Step Twenty-Eight: S&H T's Inc./Levetto Chinatown/Plaiter Place - 380-4 Spadina Ave.
Sticky Step Twenty-Eight: S&H T's Inc./Levetto Chinatown/Plaiter Place - 380-4 Spadina Ave.
Having zoomed past Guerilla Printing while battling a band of Beetle Vikings on the top of a cube truck, the Human-Lizard presses his advantage after leaving the first of three Buggy Norsemen splattered on the pavement. The odds tip in the Human-Lizard's favour at the corner of Spadina and Baldwin. 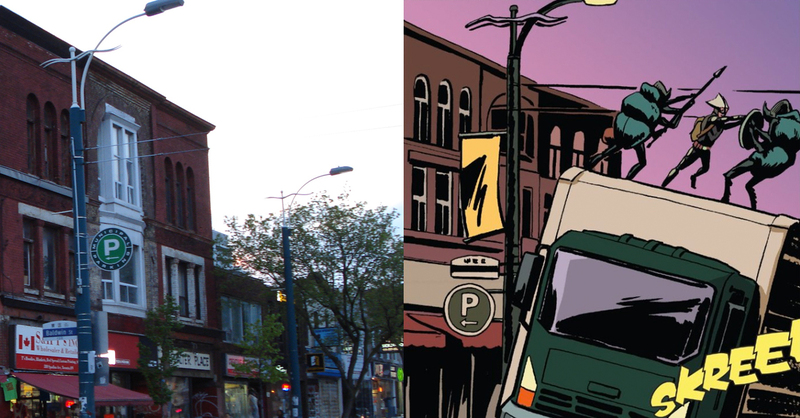 As the truck he's riding on top of makes a sharp turn off Spadina Avenue onto Baldwin Street, Lucas shifts his weight to throw one of the insect raiders off-balance. While doing, the truck passes by the storefronts between 380 and 384 Spadina Ave, home of the T-shirt wholesaler & retailer outlet, S&H T's Inc., Levetto Pizza and Pasta Chinatown and Plaiter Place, which specializes in wicker housewares and home furnishings. S& H T's Inc., Levetto and Plaiter Place at 380-4 Spadina Ave.
Next up: The Human-Lizard continues the fight for his life in front of Seven Lives Tacos Y Mariscos in Kensington Market!